Art Effects is not affilaited with any product lines in the faux finishing industry. The faux finishing product distributors we have listed on this page are products we have used, attended faux finishing workshops for or can not wait to try. We are not responsible for any results you as a faux finish artist might achieve. Although these faux painitng products can sometimes make your job as a faux finisher easier each decorative finish will be unique on its on. The final finished result depending on your artistic abilities, experience and style. At Art Effects we do hope as you increase your portfolio of faux and decorative finishes you will keep your mind always open to experiment with and try new products. We believe your faux finishes should be the result of your artistic abilities, taste and style, and how you as an faux artistisan manipulate the products you use. Mural Workshops and Lots More Murals! Faux and Mural painting supplies, brushes and books! Everything you need for your craft! Be sure to check out upcoming classes and workshops. Since starting Murals & More, Michael has been involved in mural and trompe l'oeil projects ranging from small interior residential rooms to 400' exterior commercial walls. Also an accomplished faux painter, he has transformed many walls into fabulous brick, intricate marble and marvelous textures. Michael is known for his attention to detail, as well as his whimsical application of trompe l'oeil. Learn the art and business of murals from one of the best. World-renown muralist Michael Cooper, of Murals & More LLC, distills his almost 20 years of experience into an information-rich, week-long mural workshop. And as an added bonus, his partner/wife Mickie discusses the finer points of running a mural business. Two instructors for the price of...well...two instructors. For beginners and professionals alike. Michael Cooper at Murals & More is highly recommended. Don't forget to say hello to his wife Mickie, if it weren't for her, he wouldn't be here at all. Karen Hetzer Murals Karen began painting in 1996. She is a self taught decorative artist, specializing in murals, and believes with practice and patience, anyone can learn to do this. Her intention is to provide advice and support to those who are just beginning to take their first steps to becoming a mural artist. Using short, uncomplicated video demonstrations Karen shares simple, yet effective painting techniques to help give the beginning muralist a foundation on which to grow their own personal style with confidence. Karen Hetzer Mural Classes to Go are highly recommended. a faux finishing school where "Your Imagination is Your Only Limitation". Through Kathy and other faux painting and product instructors, you can spice up your portfolio with the hottest new trends in decorative finishing. for a complete list of faux finish classes offered. Kathy has over 16 years experience in the decorative arts and interior design fields, this along with her talents in creating unique faux finishes gives Kathy a background worth sharing with other faux artisans, muralists and decorative painters. Her faux finishing school offers a variety decorative painting and faux finish classes and workshops for both industry professionals and do-it-yourself students. Not affilaited with any one product line, she offers many quality faux finishing products. The Chicago Institute of Fine Finishes and Faux by Kathy offers a wide variety of faux painting products and decorative painting supplies. "Bringing Together The World Of Decorative Artists"
is highly recommended as a faux finishing school. A leader in the faux finishing industry, Royal Design Studio offers decorative stencils, stenciling and decorative painting tools. Melanie Royals founder of Royal Design Studio and The Royal American Academy of Stencil Arts offers a level of class and sophistication that is unmatched in the faux finishing and decorative arts industry. Developed by a conglomerate of Decorative Artists and Concrete Contractors the Bella Vernici System creates a concrete staining system without limitations. Giving the architectual concrete industry a lift to new hieghts. 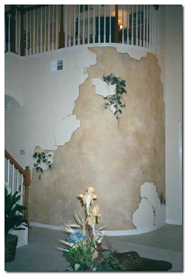 Don't miss this oppurtunity to add to your portfolio of decorative finishes. Bella Vernici is highly recommended. Rose Wilde is the inventor of the Wood Icing technique and manufactures this inovative faux finishing product. Wood Icing is a simple three-part process that can be applied to wood, metal, and plastic. This technique is a revolutionary way to resurface wood furniture, kitchen and bath cabinets with a durable, yet beautiful custom designed finishes. In a Wood Icing 3 Day Workshop students will learn the resurfacing design patterns such as...the Natural Cork Design, Reptile Skins, Rose's signature design "Cracklin' Rose", Petite Rose & Lace, Cracked Leather, Tooled or Embossed Leather and many more. The Faux Finish School offers several decorative painting classes and workshops catered to your specific needs. The Faux Finish School and Martin Alan Hirsch are recommended.